What causes neck pain and how do I treat it? In this post, I will discuss some of the common causes of chronic neck pain, some methods of effective neck pain treatment that I use in my clinic, and several approaches to simply and effectively manage it. 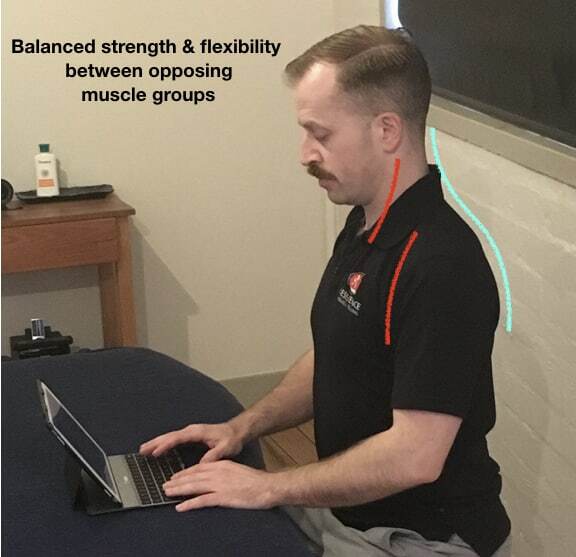 One of the most common causes of chronic neck pain today is an imbalance of strength and flexibility between several of the muscle groups of the neck and shoulders. This imbalance is often due to postural changes brought about by modern sedentary lifestyles and increasing amounts of time spent desk-bound, looking at computer screens, tablets, and smartphones. To counteract these changes, effective neck pain treatment and an awareness of simple methods of postural management are required to provide lasting neck pain relief. Technology has increased exponentially over the last thirty years. Computers are now integrated into every facet of our lives, whether in the form of desktop PCs, tablets, or smartphones. 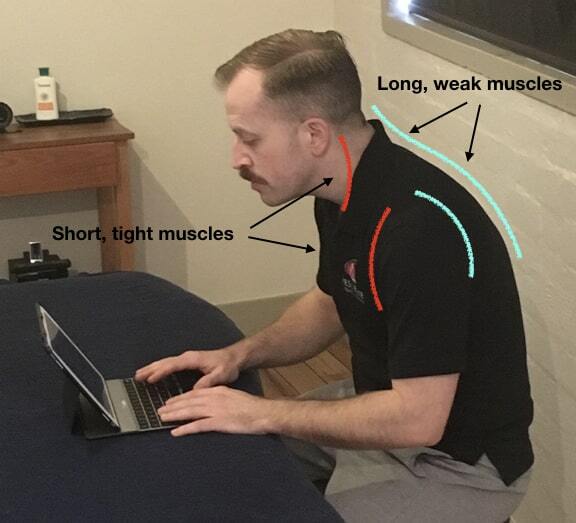 We are spending increasingly more of our work and leisure time on computers, and this has significant consequences for our postural health, of which chronic neck pain is just one of many symptoms. When looking at a computer screen, we tend to sit with our shoulders rounded and our chin and head forward (see image A below). When looking down at tablet or phone, the head is also in a forward position, and the neck is flexed. Consider For a moment the amount of time daily we spend in these positions and bear in mind that our head weighs about the same as a bowling ball! This all adds up to a significant amount of strain placed on our neck and shoulders. Image A: Poor posture exhibiting an imbalance of strength between anterior and posterior muscle groups. This is one of the primary causes of much modern day neck pain. In both of these positions, the muscles of the front of the chest, shoulders, and neck (mainly pecs, anterior deltoids, and sternocleidomastoid) shorten, and the structures of the upper neck are compressed. Conversely, the muscles of the upper back, rear shoulders and neck (mainly rhomboids, posterior deltoids, and upper fibres of trapezius) are in an eccentrically loaded position (the muscle is under tension while contracting in a lengthened position). Over time, our bodies adapt to these imbalances and positional changes, and they become more permanent and fixed features of our posture and movement patterns. This leads to restricted tissue function and adaptability which is one of the leading chronic neck pain causes. Why does sitting in front of a computer, smartphone, or tablet lead to chronic neck pain? With time, our bodies adapt to and conform to positions of altered muscle length, causing the fascia or connective tissue of these muscles to shorten and become restricted. This restriction, in turn, inhibits these muscles from returning to a normal position once a regular postural or movement pattern is readopted. Muscles incorrectly held in a lengthened position (eccentrically loaded) are usually far too weak to cope with the strain placed upon them for sustained periods of time. Consequently, our bodies respond by laying down more collagen fibres along these repeated lines of tension, and our muscles are effectively turned into hardened straps or guy ropes to hold us up. When experiencing chronic neck pain, if your muscles feel constantly tense and unable to relax, this is often the reason. The metabolic effect of this increase in collagen fibre is to impede muscle function. In other words, the more collagen that is laid down to cope with the increased eccentric loading, the more restricted and taught the tone of the muscle becomes. The more restricted the muscle becomes, the more difficult it becomes for blood to flow freely in and out of the tissue. When blood flow is decreased, the muscle’s ability to receive vital oxygen and nutrients is compromised, as is its ability to expel metabolic waste. The cumulative effect of this process of increasing muscle collagen fibre ratio and decreased muscle metabolic function is an increase in myofascial pain. How can neck pain treatment restore muscular imbalance, good posture, and achieve neck pain relief? 1) Avoid activities and postural positions that cause chronic neck pain in the first place. Our bodies also respond best to a variety of activity and stimuli. So make time during your work day to get up, walk around, stretch and do some activation exercises. This simple habit of self-care is a highly effective and underrated form of neck pain treatment and management. Sitting down for long periods of time without moving will also slow down your metabolism and will train your nervous system to dampen the ability of muscles that aren’t being used to switch on. In addition to this, you can also vary your screen height and desk layout from week to week and give your body some much-needed variety. Remember, there is no postural silver bullet, and there is no one single ideal ergonomic position. However, some postural positions will impact more on the body than others. Use your common sense here, but experiment with variety and your body will thank you! 2) Lengthen the shortened anterior musculature. Lengthening the shortened anterior musculature is a vital component of effective neck pain treatment. This can be achieved by either directly stretching the muscle (see the YouTube clip below on pec stretches) or through remedial massage therapy. Massage for neck pain can be highly effective when performed with precision, on the right tissues, and at the correct depth. The massage technique that is of particular benefit here is myofascial tension technique (also known as myofascial release technique). The primary focus of this technique is to restore the ability of the muscle’s fascial interfaces to slide and move. Muscles that have the ability to slide and glide freely will return to a normal resting length, will perform better, and be less prone to injury and pain. Many people often only seek a myotherapist or remedial massage therapist out when they are in chronic debilitating muscular pain. However, regular remedial massage therapy and myotherapy is a fantastic preventative measure for reducing the risk of soft tissue injury and maintaining optimum muscular health and function. Many of my clients that are professional athletes will have a regular weekly massage to keep their bodies in peak form. However, for the rest of us, a regular monthly tune-up is a good habit to get into. Massage for neck pain should be a preventative measure as well as a treatment method. You don’t wait for your car to break down before taking it to a mechanic, do you? Your body should be no different. Look after it and it will look after you. For more information on how remedial massage and myotherapy can be of benefit to you click here. 3) Strengthen the long weakened posterior musculature and restore normal metabolic function to these muscles. This is one of the most neglected aspects of many training and rehabilitation programs. It also is an essential component of effective neck pain treatment. People often assume that because the muscle feels tight or painful, that it needs to be stretched. This is not always the case. Stretching an already weakened, fatigued, and lengthened muscle will exacerbate the condition and often increase muscular pain and further impair muscle function. Instead, specific and targeted strength training exercises will greatly improve these weakened and dysfunctional muscles. However, there are many additional factors to consider here. For example, what is the functional purpose of the muscle? Is it’s functional deficit as a prime mover, a stabiliser, or a neutraliser? Is it lacking strength in the concentric or eccentric phase of contraction? What are the specific demands that the client’s lifestyle/sporting activities are going to place upon the muscle? As you can see, the science of strength training can get quite complicated quite quickly and I’ll leave answering these questions for another post. Remember, it is best to always consult with a qualified strength and conditioning coach, myotherapist, or physiotherapist for advice on designing any new training program, especially if the purpose of the program is for rehabilitation or pain management such as chronic neck pain relief. Another way to improve the metabolic function of long and weakened muscles is through utilising Remedial massage technique of trigger point therapy. A trigger point is a hypersensitive point in the muscle that develops when the muscle becomes weak, fatigued, or overused. Trigger points are what many people commonly refer to as ‘a knot’ in the muscle tissue. By deactivating the trigger point through digital pressure or the precise placement of acupuncture needles into the trigger point (dry needling), the muscle will relax, circulation will be improved, oxygen and nutrients will be able to flow in, and metabolic waste will be able to flow out of the muscle more effectively. An added benefit of this form of massage for neck pain has is that it will also generally result in a significant reduction in muscular pain. However, it is important to note here, that while trigger point therapy is an effective means of treating the immediate pain, if the other causal factors such as strength deficit and postural imbalance are not addressed as part of a comprehensive neck pain treatment plan, symptoms will soon return. Therefore, a multidisciplinary approach is required for permanent and lasting results. For best neck pain treatment results and to maximise both the speed and effectiveness of recovery, it is my recommendation that all three approaches be incorporated into a complete and comprehensive rehabilitation plan. Understanding the cause, avoiding exacerbating activities, lengthening shortened muscles, and strengthening long weak muscles are basic core rehabilitation principles that should inform every training program. These principles are equally applicable when designing a program to optimise athletic performance. Whether your goals are injury recovery, pain management, or maximising athletic potential, achieving a symmetry of flexibility and strength across opposing muscle groups and a balanced posture will help you recover faster, perform better, and be more physically resilient. If you would like to experience directly how this treatment approach can be of benefit to you, click the button below to book an appointment online for either massage or training. This website is mostly a walk-via for the entire info you needed about this and didn’t know who to ask. Glimpse right here, and you’ll definitely uncover it.